Dortmund started the new Bundesliga campaign in less spectacular manner than that of the season just gone. They showed particular struggles in possession as they adjust to life without Hummels, Gündogan and Mkhitaryan. Although Tuchel’s men were able to overcome Mainz, it wasn’t the most comfortable of performances against what was an effective defensive strategy from the away team. Despite having 4 (5 if including Passlack) new faces in the starting eleven, Tuchel opted for a shape which was the ‘go-to’ of last season. Bartra replaced Hummels in the left centre-back position with the hopes of emulating his predecessor’s playmaking influence. Sebastian Rode started ahead of Weigl, who was instead to be found on the bench. The wide positions saw two new faces with the Bundesliga’s best player of 2015/16 Mkhitaryan now applying his trade in the dugout of Old Trafford whilst Reus was held back by injury. In their place, Schürrle had a promising league-debut down the left whilst the same could be said for Dembélé, who impressed Mainz’ Balogun in particular. Yet as a result of these changes, the dynamics of the structure were largely different to that of last year. Where Mkhitaryan would drift inside to complement the spacing, Dembélé stayed much wider, in a position where he could receive the ball to then make his dangerous direct runs. With Dembélé wide, Felix Passlack played more of an inside role, particularly during build-up where he created a 3-chain in the first line, similarly to how Piszczek had done during the second half of last season. Aside from the shift in positional dynamics, the focus of Dortmund’s attacking in the final third saw a rather significant change. Over the course of last season, we became familiar with a team-oriented attacking style which saw a large quantity of combinations between a closely-positioned attacking four. Dortmund broke through the opposition by working as a team in tight spaces, creating space for one another and using overloads to good effect. 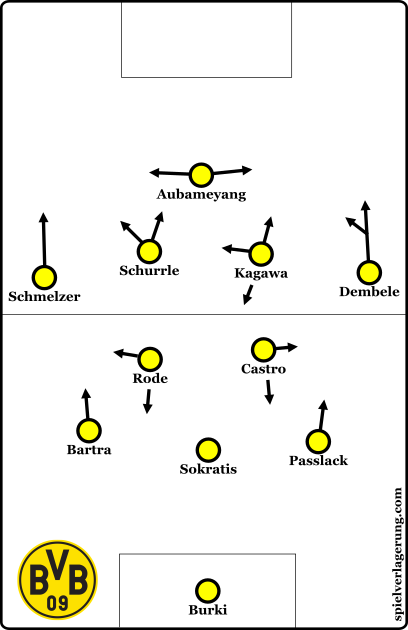 Dortmund often shifted into a 3-2-4-1 shape. With neither Schürrle nor Dembélé the most combinative of attackers, such a playing style was no longer to be seen as they opened up their Bundesliga campaign. Instead, Dortmund looked to break through more frequently down the touchlines through more direct dribbling from Dembélé in particular. Such a strategy complements their player profiles well, and was effective from the start against Mainz. Dembélé was Dortmund’s biggest threat for large periods of the game, attacking Brosinski constantly down the right with his ambidexterity showing in the fast and skilful dribbling. One of the other big changes from Dortmund was their regression in playing out from the back. Last year, the two key players in this phase were Hummels, with his excellent passing range and Weigl, who’s ability to form connections between teammates was crucial for the ball circulation. It was no surprise then, to see Dortmund struggle to pass out of their own third without the presence of these two. Instead it was Rode who was responsible for supporting the build-up, a player who is more focused on the defensive side of the game than supporting his team’s possession. The result was a weaker structure from the home team and much fewer passing options were created into the midfield. Without the presence of Weigl, it was right-back Felix Passlack who was given the responsibility of creating a 3-man defensive line as the 18-year-old held a deep position during the early stages of possession. It’s likely that Tuchel deemed this necessary, considering the transitional threat of Yunnus Malli and the other Mainz attackers. Aside from preventative measures, this asymmetry also helped Dortmund’s spacing higher up in the structure. The back-3 gave greater security for Schmelzer to get into advanced positions as he does so well, then through the full-backs occupation of a higher position down the touchline, it gave Schürrle more of a capacity to move inside through the left half-space where he could hypothetically threaten between the lines. Dortmund dominated the possession of the ball, finishing with a staggering 74% share according to WhoScored. Yet despite so much of the ball, they failed to create many chances from it, making just 1xg (excluding the penalty) according to Michael Caley’s model. The home team’s ball circulation was largely horizontal, as they were left searching for routes into the 10 space behind Mainz’ well organised midfield. In many ways, Martin Schmidt’s game plan was designed to allow Dortmund possession in such a manner, as it’s no secret of the playmaking capacity which they have conceded over the Summer transfer window. In order to break through the opponents’ midfield block, Dortmund attempted to create a small overload between the lines of Mainz’ midfield and defence. 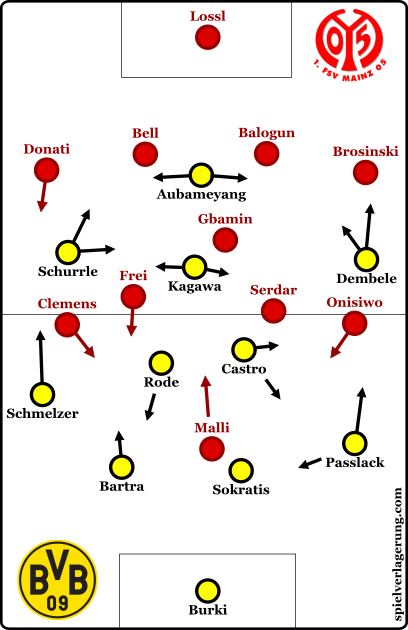 Gbamin was often following the movements of Kagawa whilst the two central midfielders tracked their opposites in yellow shirts. With each man occupied, there became potential for a free player to drift inside and he would hypothetically be unmarked. With Schmelzer pushing high on the left, this role was given to the responsibility of Schürrle on his league debut for the club. Shürrle came inside with the intention of being the ‘+1’ against an occupied Mainz midfield. Although Schürrle was able to find space commonly enough, it wasn’t often that Dortmund were able to access him. In a number of scenes, Mainz adjusted well to either close out the gap or block any passing lanes into the former Wolfsburg winger. During possession in the middle third, it was common to see Malli drop onto one of the Dortmund 6s, which in turn would give a midfielder more freedom to move out to the spaces surrounding Schürrle. If this was not possible, they were often able to use intelligent pressing movements and the use of cover shadows to restrict any passes. Alternatively, the responsibility of breaking the Mainz midfield line was given to Marc Bartra, just as Mats Hummels had done so regularly last season. With the security of the 3-chain, he drove the ball forward when it was possible, moving it into a position where he could better penetrate the midfield line. At times he looked to invite a midfielder out of position to come and press him, thus opening space for his teammates between the lines. Despite this, his passing wasn’t as effective as it had been in previous outings. Götze’s movements would’ve helped Dortmund in these moments. A player such as Götze would suit such moments much better. Once he’s fit, the playmaker could play an important role in complementing Dortmund’s structure, as his interpretative movement is focused on improving his team’s spacing by forming connections where necessary depending on the play. However, with him not fully fit, Dortmund at times lacked the ability to adequately link up the attacking four and ultimately struggled to generate many dangerous shots. As Dortmund failed to consistently progress the ball through midfield, they became somewhat reliant on the work of Dembélé to advance the possession. He would receive passes quite early in the possession, often taking in passes to the feet from Passlack or Castro. Immediately after getting the ball, he would turn to face his man and display his speed in driving the ball forward. Through doing so, he helped his team to gain space and progress the ball upfield quickly, whilst creating some dangerous openings if he managed to beat his man completely. For all of Dortmund’s self-inflicted issues, credit must be given to Martin Schmidt’s Mainz, who had a clear defensive plan which was executed rather well. 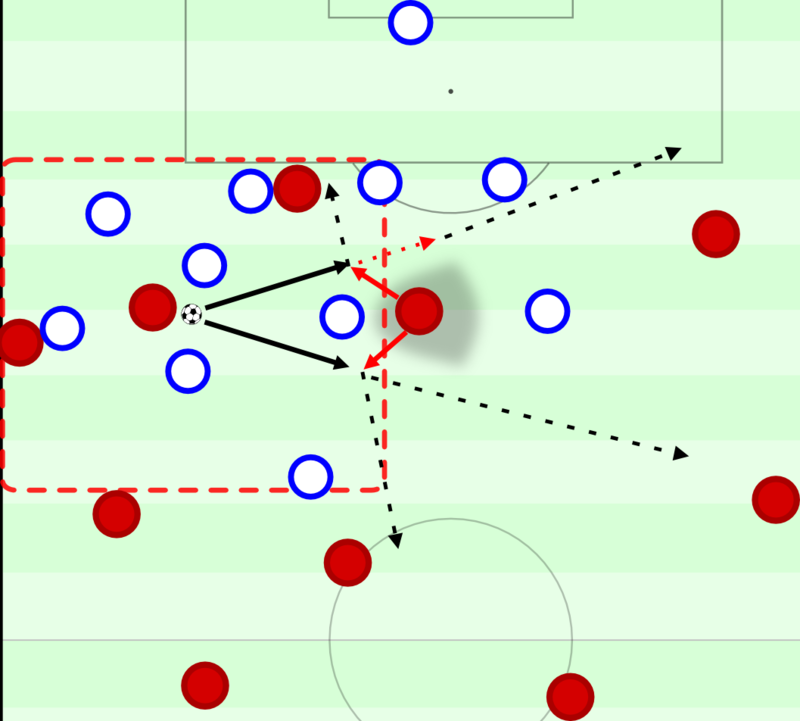 During the home team’s build-up of play, Mainz were particularly focused on a man-oriented coverage which involved a close following of Rode and Castro and the spaces around them. They weren’t necessarily going man-to-man and had a degree of flexibility. Instead they were oriented around having strong compactness around the Dortmund players and blocking any space around them as they tried to restrict the options for the ball-carrier. Mainz’ blocked access into Dortmund’s midfield quite well. The tightly-knit nature of the defensive block gave Mainz’ midfielders strong connections to strengthen their pressing. When the opposition were looking to progress the ball forwards, they commonly had multiple men covering each immediate passing option through an intelligent man-oriented game. Through restricting the space in the centre, they forced the home side into looking towards the wider areas of the pitch for ball progression. Mainz’ midfield compactness had a strong control over the midfield. Such a defending style is something which troubled Dortmund on a number of occasions last year. Even with their full-strength squad, they struggled to free themselves from the opponent’s defensive coverage and their build-up in particular was badly affected. It was a similar story against Mainz, as Rode and Castro were largely unable to find space in any position of value. In many cases, the only way that either were able to receive the ball was to drop closer to the centre-backs. When this happened, their marker would simply stay tight to them and restrict their ability to turn, making them harmless from such a position. Dortmund when into the interval with a 1-0 lead, but looked far from convincing in their first 45 minutes of the new Bundesliga season. Their stale possession had lacked penetration in build-up and Mainz could defend fairly comfortably whilst posing some threat in transition. With his team struggling, Tuchel had to make an adaption to the system in possession. He did so by inverting the midfield shape, turning it into a 1-2 midfield with Rode as a lone deep midfielder as Castro played closer to Kagawa. With the attacking midfield spaces better occupied, Schürrle took on a role closer to the touchline and in turn, Schmelzer played a more conservative role, deeper in the structure. Through this, they looked to free themselves of the defensive pressure from Mainz. They no-longer matched the midfield shape of Mainz with 2 midfielders positioned around Gbamin now with just Rode around the spaces of Frei and Sarder. Hypothetically, this could disrupt the orientation of Mainz, who would now find it more difficult to execute the man-oriented movements which had been done rather easily in the first half. Dortmund were able to find gaps in Mainz’ midfield after adjusting their structure. The switch worked well immediately following the break. On a couple of instances, Gbamin was exposed in a 2v1 overload with a player on either side of him whilst the two Mainz central midfielders were positioned higher up. However, Schmidt’s team were fairly quick to adjust and tighten up these gaps. Serdar began to drop slightly deeper than Frei, where he would cover Castro more closely whilst Gbamin covered Kagawa on the left. Mainz didn’t necessarily change their structure, but simply adapted their staggering to better cover the change in shape from Dortmund. Despite their adaptions, Dortmund were still better off from the change in comparison to the first half. Their build-up had a better level of penetration and their better simultaneous occupation of both half-spaces allowed them to open up the visitors more consistently. The second key change in the match was the introduction of Julian Weigl for Gonzalo Castro. The 20-year-old moved to the pivot spot whilst Rode took on a higher position on the right 8. His presence was immediately felt, with his excellent team-tactical intelligence allowing him to support Dortmund’s deeper structure. With him, their verticality improved and within a minute of entering the pitch, he was able to dismark from his opposition and play a midfield-splitting pass to Kagawa in the left half-space. Much more of a natural in the pivot role, he was able to direct Dortmund’s ball circulation better and complemented his teammates superbly. His team-tactical intelligence and individual pressing resistance brought a greater level of penetration to Dortmund’s build-up, as well as giving more stability against the defensive pressure of Mainz. Yet as the match drew to a close, Dortmund’s structure began to worsen. For some reason, the 8s weren’t occupying the half-spaces as cleanly and Dortmund spacing became disconnected with less of a control of the central areas. Both Dembélé and Schürrle began to become somewhat isolated on the touchlines and were found less frequently in dangerous positions. Noticing this, Tuchel brought out his tactics board during the drinks break and instructed them to both make more diagonal movements into the centre (s/o to MA for spotting this). Schürrle gladly obliged and in the 88th minute he capped off a strong league-debut by winning the penalty which Aubameyang converted. Although they struggled for large periods of the game, Dortmund were able to overcome their visitors through individual quality and intelligent in-game management from Tuchel. Patience will be required as the team adjust to life without Mkhitaryan, Gündogan and Mats Hummels. As for Mainz, they can take a number of positives away from the match, despite the eventual loss. Their game plan was executed fairly well, exposing Dortmund’s issues in build-up particularly throughout the first half.